No, that's not Photoshop. This Saucey flair bartender, Flairin' Farron, is balancing a bottle of Absolut on his elbow. Wow, booze delivery app Saucey is on fire with the promotions lately. Last month, it offered you your very own Frank Sinatra. Starting today (and available every Friday from 5 to 10 p.m.), you can order up an instant cocktail lesson, where a bartender brings you booze and then teaches you how to make drinks with it. You’ll have one more cocktail in your repertoire. The app already offers cocktail packages for various drinks, from the simple Mimosa to a Manhattan. But for this new promo, there will be two new featured cocktails each week. This week it’s an Absolut Mandarin Punch (Absolut Mandarin, ginger ale, pineapple juice, lime juice) and a vodka Sunrise (Absolut vodka, lime juice, orange juice, grenadine). The way this “Mixologist on Demand” service works is once you place your order, a bartender will arrive at your doorstep within 20 to 60 minutes, already equipped with all the necessary bar tools, ingredients, and cups. You’ll then get schooled in how to make the cocktail you ordered. The insta-bartender will stick around long enough to serve the first round before he leaves you with the ingredients and heads off to the next cocktail emergency. 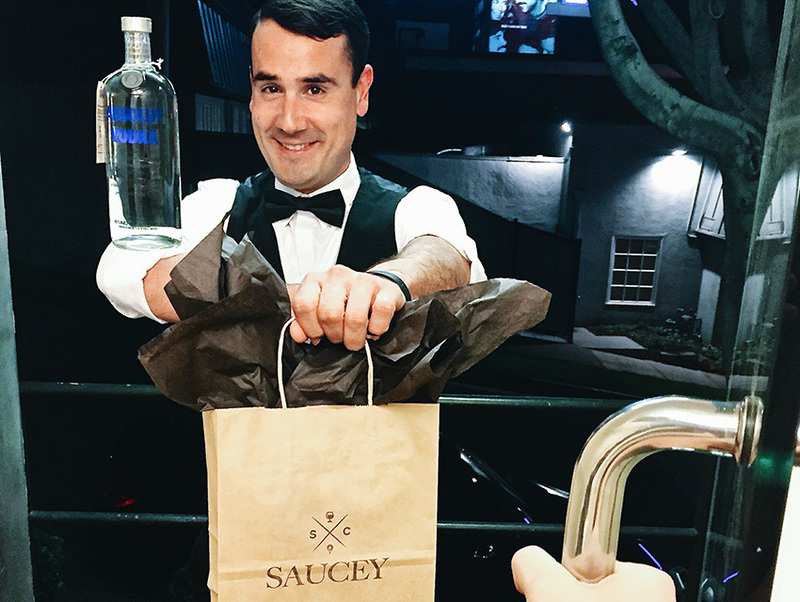 If you’re really lucky, you’ll get one of Saucey’s many flair bartenders with your order and get to learn the fine art of flipping a cup. Tip: It’s easier when you’re completely sober, but more fun when you’re not. Most of the bartenders have worked at places like Melrose Umbrella Co., Wolfgang Puck restaurants, and Boa. So no bartender-school students. Packages range from $80 to $100 and will serve about 10 people.